This is not the "E. caespitosa" of gardens, which is E. lobbii, but rather an annual of foothills and mountains from extreme southern Oregon south to extreme northern Baja California. The species is most common in the north Coast Ranges and Sierra Nevada foothills. 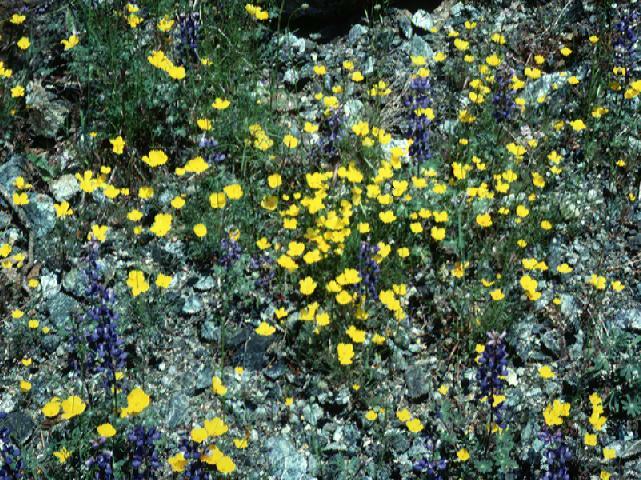 In appearance it resembles a diminutive E. californica, without the receptacle rim and with orange restricted to the base of the yellow or gold petals, or absent altogether. It is frequently found on serpentine soils. PLANT annual, 0.5-3 dm tall, erect, tufted, glabrous or slightly glaucous. LEAVES basal and cauline, terminal divisions obtuse or acute. INFLORESCENCE cymose or solitary. FLOWERS erect in bud; receptacle conic; calyx abruptly soft-pointed, glabrous; petals 1-2.5 cm long, yellow, sometimes with orange spot at base. FRUITS 4-8 cm long. SEEDS 1.5-2.4 mm diam, ellipsoidal to obovate, reticulate, brown to black. 2n=12. 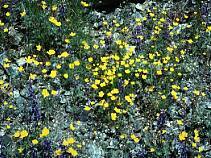 Open areas in chaparral; 0-1500 m. California Floristic Province s to n Baja California; sw OR.